Once your baby reaches approximately 6 to 8 months of age, it's time to introduce solid foods into her diet. After cereal, strained fruits and vegetables are the most popular starter foods. 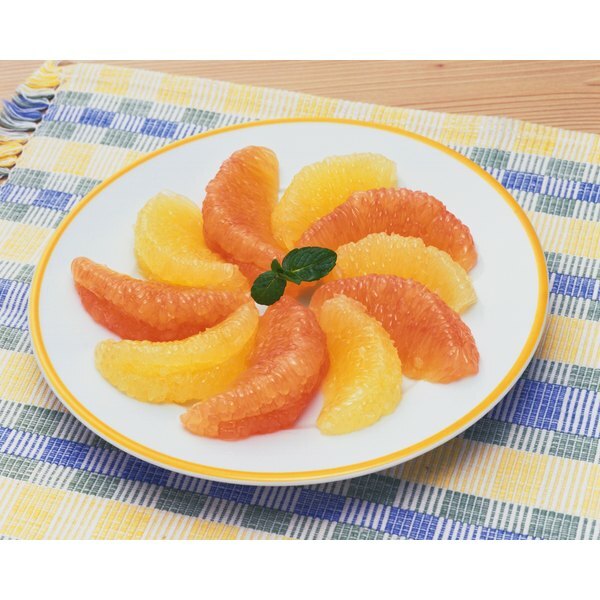 Grapefruit, according to the United States Department of Agriculture, are citrus fruits that come in a variety of colors. This fruit is easy to prepare, rich in nutrients and can be added to yogurt or pudding. Including grapefruit in your baby's diet can add a unique flavor, dietary fiber and vitamins that can help keep your baby healthy. Check with your physician before adding any food to an infant or toddler's diet. Half of a medium grapefruit contains approximately 70 percent of the recommended amount of vitamin C for an adult, according to the United States Food and Drug Administration. It also contains 2 percent of the recommended daily amount of calcium for an adult. Grapefruit also contains a modest amount of dietary fiber, carbohydrates, natural fruit sugar and protein. A half of a grapefruit contains approximately 40 calories. Much of the health benefit of grapefruit for babies lies in the vitamin, water and fiber contained in the fruit. Although there is no recommended daily allowance for vitamin C for infants, babies over the age of 1 require 15 milligrams daily, according to the National Institutes of Health. Constipation, a common condition in babies, can be decreased by the consumption of fiber-rich grapefruit. Finally, the calcium found in grapefruit can add to other sources of dietary calcium that the body uses to build and repair teeth and bones. Small amounts of grapefruit, finely chopped, pureed or whole, depending on your child's age, aren't likely to cause an adverse reaction. Any new food should be introduced slowly and your child should be monitored initially for an allergic reaction to citrus fruit. Consumption of grapefruit with inadequate tooth and gum hygiene can lead to dental caries from the sugar in grapefruit and enamel wear from the acid. Grapefruit also can cause an unwanted interaction with several over-the-counter and prescription medications, such as antibiotics. If you are considering feeding grapefruit to your baby, cut the fruit into manageable pieces and stay with your child while he eats to decrease the risk of choking. Vary the fruits you feed your child to round out the variety of nutrients provided. Grapefruit that is not consumed should be covered in plastic wrap or placed in a plastic container and used within two days. Although many people prefer to eat grapefruit with sugar for sweetness, the National Institutes of Health explains that sugar can contribute to dental caries and can decrease appetite.